Niraj has been a central pillar of support for so many friends, extended family, and the broader community. He has always been a fiercely independent thinker, an extremely productive member of the society who took great pride in his work, and willing to go to great extent to help everyone around him. 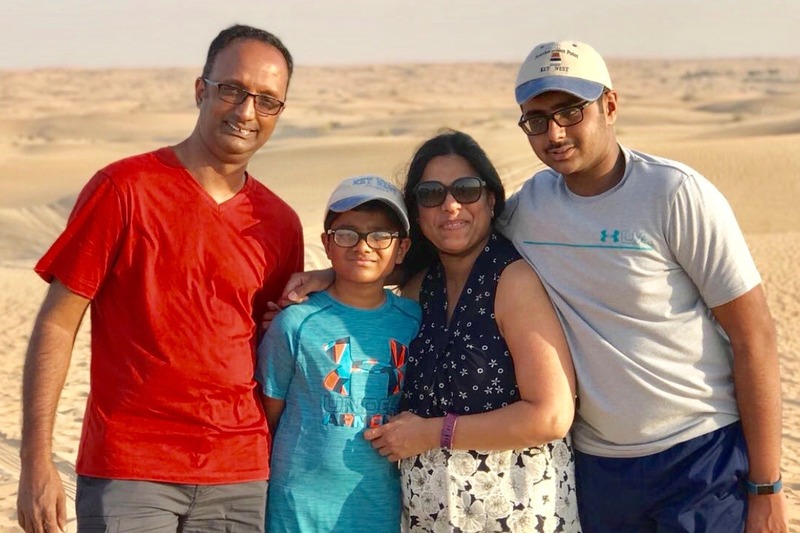 In a gut wrenching and totally freak accident on the morning of Jan 16th, Niraj slipped and fell on the driveway in front of his house and injured his head. He was immediately rushed to the hospital, where the surgeons operated on him for over 4 hours to address the damage in his brain caused by the fall and the resultant internal bleeding. Despite the best neuro care, Niraj has been unresponsive and has slipped into coma. He is currently in critical care at the hospital sustained by feeding tubes and ventilator, and the prognosis is that it is only a matter of time (2 or 3 days at most) before he will no longer be with us. As with everything in his life, Niraj is even now being thoughtful in allowing us all to come together, in grieving and adjusting to the new reality of not having him around anymore, and in putting in place a supporting financial structure for his immediate family - comprising of his wife, Bhavana, and two handsome boys, Shrey (15 yrs) and Ronit (11 yrs). He is 48 yrs old. As organizers of this GoFundMe campaign, it is important for us to indicate that we are all very proud of his contribution to his immediate family, in terms of ensuring that they will be provided for financially for the kids to grow up and attend college in the future. Achieving such financial sufficiency at this age in his career is truly remarkable. Although the long-term sustenance is taken care of through the funds that Niraj has saved and provided for, we would like to make sure that Bhavana, Shrey, and Ronit can be free to mourn and grieve their loss and not have to worry about paying the bills immediately. Focus of this GoFundMe campaign is to raise enough funds to help the family pay off their mortgage (~150K), handle medical & related expenses (~50K), and provide finances for living expenses next 12 months (~50K). Note that all your contributions will go directly to the family’s bank account. We urge you to direct all your contributions through GoFundMe (instead of sending in cash or mailing in checks), as it will keep the processing simple for Bhavana. Any other gifts or flowers you’d consider sending, please use those funds towards GoFundMe as they will be more useful and go a much longer way in easing the transition for the family. Thank you and keep smiling (as that is what Niraj would’ve wanted everyone around him to do). Thank you for all your wishes, contributions, and ongoing support to help Bhavana, Shrey, and Ronit through their darkest hours. Please note that through your support, we have been able to raise $170k for the family, which will go a long way in helping them. We can't thank you enough. On a related note, the GoFundMe campaign has accomplished and exceeded what it set out to do. Hence, we as the organizers, have made the decision to bring this campaign to a close as of end of this week (week of Feb 4th) - making provisions for a few of the friends and family who have explicitly requested they be able to access the account for contributions till end of the week. Once again thank you all for your generosity and support. Please keep Bhavana and the kids in your prayers as this will be a long road ahead of them. Niraj, My Jijaji changed our lives forever. Arriving from humble origins he built a wonderful family, achieved professional, educational and financial succes. He made and maintained many many friendships. He lived life to the fullest - enjoying and savouring it. He always made plans at a leisurely pace. He showed us all so many great places. Niraj Jijaji got engaged to my sister Bhavan Jiji and brought fun back into our lives. He was and still is a source of my inspiration. He always encouraged me to do better. He made me laugh. He was always interested in what I had to say. He was always interested in listening to my opinion even if I could not change his. He was a traveller and adventurer who loved to see new places. I will always remember him. Life of Niraj Dhondi was honored and celebrated last week ( Jan, 23rd, 2019). I would like to thank everyone who has come here on this very hard day. As you may know I am Niraj’s son Shrey and I have a few words to say about my dad. As you all know my dad passed away on the 21st of January. I know it's hard to see my dad like this, but he had a wonderful life. He was a quiet, but social man. He formed many lifelong friendships as I can see from everyone here. He was a great man. He always looked for the best in everyone and everything. He was a very calm man. He never got angry at anyone. He was a man of many talents, he was a very loving father, telling me and my brother to always give everyone a second chance and to push on after moments like these. We all loved him and I promised him that I would carry on his legacy for him. I know I will honor my father’s memory. I remember that it was only a few years ago; my dad and I talked about a moment that changed him forever and made him who he is. This moment I am referring to is his story about how he made it to America. He loved telling me this story and I am sure he would love for all of you to hear his story too. This story begins at a small airport in Monroe, Louisiana. It was so small that the airport closed at 10:00. He arrived at 7 on a dark and gloomy night. He was tired and scared. He didn’t know what to do in such a strange and alien place. He was desperate. He needed a ride to his university: Louisiana Tech. This was his first time away from home. He looked and looked for someone to help him; for someone to help him find his way, but to no avail. Then suddenly as if luck had struck, he found help. A stranger with a Louisiana Tech T-shirt, who was also going to the college. My dad asked this man for a ride to Ruston: the town of the school, and was greeted with the kindness and the very openness that we all knew my dad for. This stranger had decided to give my dad the ride he so desperately needed; and just like that my dad had gone off to college. He told me that he finally realized the world will be nice to you, as long as you are nice to it. That moment shaped him into the great man we all came to know and love: the kind and persevering leader who never backed down from a challenge. My dad is a hardened survivor, he started with moderate means, from the city of Hyderabad and after arrival in the United States, he pursued the American dream fiercely, always striving for more and always aiming for the best. He was a man of many ambitions and an idealist. He wished for a society in which humans continued innovation, and he wanted to be a part of it. But most of all, he was a teacher. He taught everyone many things, whether it was moral, academic, or social; he touched the hearts of many. He would want all of us to pass on his teachings, to pass on his dream, to pass on his story. And we all could benefit from following it. Not for me, not for my family; but for him. We must all honor his legacy and his memory. And from the bottom of my heart, thank you dad, thank you for all you have done for us. Now I hope you rest knowing that we all love you so very very dearly. All men die....few ever really live. Niraj..you were such a man...a rarity amongst men who lived and loved to the fullest . You were more a brother to me than a brother in law . we shared a bond where we could pick up things right where we left them. ..always connected. Rest in peace brother and be assured that your family shall lack for nothing in their lifetime. Buddy as he fondly referred to me, Niraj touched our life in beautiful ways, I remember the day he entered our house on his engagement changing the vibrations entirely, there was so much happiness that he spread from that day onward, on his little visits to India one full day was dedicated to spending time with me, we did some silly things & funny banter together alas my dream of visiting US & make a duet album with you remains unfulfilled, as much as I promise to take care of Bhavan & children Niraj, but will never be even close to filling the void you’ve left behind, Adieu buddy Ascend on your journey onwards with ease till we meet again. As honoured as i am to say a few words today, this is not an honour ive ever wanted in my life, Mausa, Niraj Dhondi as known by all here, was nothing short of a gentleman and a man of his word and principles. He fought strong and hard but always smiled through it. He was an easy going, happy go lucky man who never frowned upon anything or tolerated one on any of his loved ones. When i was 6 i remember him taking me to "Gulliver's land" on a joyride where we both had to paddle to move forward and the little me just couldn't go any further and gave up, as expected he did it all by himself and pulled us through, just like he did for everyone, unconditionally always. we had plans, Greece? Photography trips? Amsterdam? oh countless plans we made Everytime I video called him, we argued about stocks and bonded over frank sinatra. I used to rant about my over ambitious dreams and he'd humble me down. we always teamed up and pulled my mom's and masis leg and that was probably our little bond that just the both of us shared but above and beyond all of this, i made him a promise, that ill do right by his and my family's side and i will, as much as i wish he can be there to see that, i know hes always looking. To everyone out here, it may be stormy now but it won't rain for ever.